"everything's making a big casserole"
Welcome to the Big Casserole Records Catalog, limited as it may be. All of our releases are on cassette. In this way, we are able to offer low quality recordings at an affordable price. Also, we can get our supplies at the drug store. What was life like BC*? You don’t want to know … . 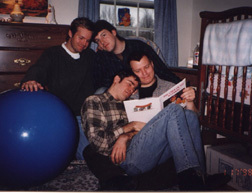 featuring The Throats' Coda, the follow-up to their swan song; Pizazz, with Snow Day, their mini-masterpiece recorded on a winter's day when their office was closed due to inclement weather; and The Feebs, who present the suburban gothic Nothing New, a tremendous offering of musical literature. It's what recording on a four-track is all about! bcr 025. · Once again, The Feebs deliver their peculiar blend of sadness versus sass, and you’re invited to sing along. Features superhits Ask Anyone, Hate For Henchmen, and Someone Xtra Special! Following are all music titles available from big casserole, listed alphabetically by band. Finding our incredible roster daunting? Try a compilation (listed under Various) instead. Happy listening! See "Featured Releases" for more information on the triple-EP featuring some of Big Casserole’s biggest stars! Thank You For Time - The Big Casserole Sampler! (1999) Features ALL of Big Casserole's biggest stars! "everything’s making a big casserole"